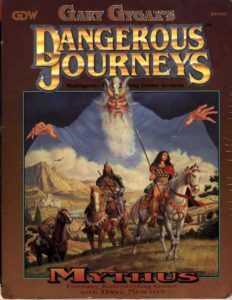 About three years ago I wrote a post about my love-hate relationship with Dangerous Journeys, the game Gary Gygax designed after leaving TSR. Since then I’ve had the pleasure of playing 12 sessions of a Dangerous Journeys game run by an expert in the system. Whereas I am something of a system hoarder, with hundreds of rulebooks supplements for scores of games, Lars has devoted himself to Dangerous Journeys for years. The experience has confirmed my initial views that this is a highly playable system. I have learnt that it is also an atmospheric one, and highly enjoyable. Now, it is a truth in gaming that a good gamesmaster can make a badly designed game fun, and Lars is certainly a good gamesmaster. It is also true that Dangerous Journeys is not a user-friendly game; its organisation leaves much to be desired, and there are many special cases and exceptions to the core rules buried in paragraphs far from the chapters you’d expect. It is therefore a difficult game to learn. Certainly, Lars’ first task was to introduce myself and the other players to the rules, advising us on abilities we’d find useful for our character concepts. It helped that he created a handy Excel character sheet to keep track of Mythus’ many subskills and heka (magic point) calculations. I covered character generation in some detail in the previous post, so I wont rehash it here. While character generation remains complex, I really don’t mind that if it leads to evocative characters, and with my character I managed to find a very suitable set of skills to flesh out her background – as the daughter of an innkeeper I was delighted to find she could have a rating in commercial household management, and in appraising the quality of food and wine. And Mythus proved to be much simpler in play. Percentile-based systems are intuitive, and although the difficulty levels are granular (moving from Hard to Difficult halves your effective skill), this is modified by using Joss (Hero Points) if you really need to succeed. Joss proved to be one of the major features of the game. I haven’t played many systems with a hero point mechanic, so its importance eluded me on a simple read-through of the game. You can spend Joss not only on yourself, but on behalf of other PCs, which helps encourage cooperative play. However, they don’t regenerate between sessions or adventures, but must be earned. This means you can quickly deplete your stock – several times we suggested using Joss to help a roll, only for Lars to ask us if we really thought it was worth it. He was right, of course – Joss can be such a game-changer that it is worth saving for the big encounters or the must-succeed attempts. One of the uses of Joss is in damage – before damage dice are rolled you can choose to have automatic minimum (useful if you’re about to take damage) or maximum (if you’re dishing it out). Lars was strict about enforcing the only-before-a-roll rule as well. If absolutely necessary, you can burn unspent experience points as Joss. Obviously, it’s not a particularly good strategy – using them like this means they’re not available for boosting your character’s skills – but if it keeps your character alive it’s a good last resort. The other major quirk of the system is the potency of magic. Like (A)D&D, Mythus classifies spells into 9 levels or grades based on their potency. It’s not uncommon for a heka-user to being play with access to fourth- or fifth-grade spells – the equivalent of being a 7th-9th level spellcaster in D&D. There are many kinds of magic too, and I quickly discovered our party spellcasters could act as force multipliers on my melee-only rapier-wielding street bravo – one of our most effective combat methods was to have my character rush in, boosted in speed and magic resistance by the spellcasters, to attack twice as fast, and with the judicious use of Joss when necessary. Since her Special Combat skill allowed her to target vulnerable parts of the body, she proved devastatingly effective in combat. She picked up many injuries, though. Mythus doesn’t allow a parry unless you forgo an attack, and I quickly discovered I’d better forgo the idea of a renaissance rogue in light leather armour and supplement that with a helmet and some armoured boots. Even then, she relied on herbs or clerical healing after most fights. Fortunately, one of her contacts was a priest (none of the other PCs – sorry, Heroic Personas – were), so at least she had a healing source back at base. The combat system, by the way, is moderately deadly – I’ve played worse, but an unlucky roll can hurt your character badly, and large-sized creatures such as ogres can easily kill in a single blow. That’s where I discovered failing to give my street bravo any missile weapons was a strategic error. However, she could make relatively short work of the goblins while our dweomercraefter dealt with the ogre by peppering it at a distance with magic. And therein lies another feature of Mythus. Balance is not a primary consideration of the game. Dweomercraefters and priests have access to potent magic. Others may have buffs or protective charms, but the raw power of a specialist magic user is difficult for a sword to match. I know that bothers some people, but to be honest, it doesn’t matter to me in the slightest. So long as my character has an interesting story, I don’t need to be the baddest on the block. And it’s been fun roleplaying a street tough proud of her smarts and her sword skills watch the delicate flower magician take down a creature she’s too scared to go toe to toe with. And it’s been Lars’ ability to make sure each character has something interesting to do – whether by his own design or by running with player ideas – that’s helped make this introduction to Mythus at the table such an enjoyable experience. However, spellcasting is often a lengthy process, and a spellcaster will have to choose which spells to keep ready. Readying a spell doesn’t take anywhere near as much time as AD&D’s spell preparation – it can be done in minutes, rather than overnight – but the number of spells that can be prepared in advance is very limited. Spells quick enough to cast in combat may still take several rounds to cast, and are usually much more limited in power. And a sword will remain effective as long as its user. Combat, the way, is primarily narrative. There’s none of the tactical movement found in games like Pathfinder or GURPS advanced combat, nor discussions of frontages like AD&D. Miniatures or tokens are not necessary. Lars was using the more complex optional initiative system from the core Mythus rules. I’d dismissed this version as unnecessarily complex on a rules read-through, but found it better in play. He also used various rules from Journeys, the Mythus magazine, and the Mythus Masters Magazine, which circulated electronically. I found a few prior calculations – totalling character speed, weapon speed penalty and armour penalty beforehand, so the actually initiative roll boiled down to one dice roll and one modifier speeded and simplified the process greatly. The same could be said for the spellcasters, whose heka regeneration and ‘aperture’ (the amount of magic points you can spend in one go) is better calculated in advance. Tricks like this is where Lars’ experience made the game flow better, as there’s no real suggestion in the rules that one do the prior calculations, nor space on the official character sheet to record them. 1) Poor organisation means the game is difficult to master. Not only are relevant rules scattered around the core rulebooks, but a couple of important rules (such as readied castings, which allow a spellcaster to prepare spells in advance to reduce lengthy casting times) were missed from the book and published later in the game’s dedicated magazine. 2) It produces evocative characters, each capable in multiple areas. A sword-slinger, rogue or spellcaster will have a broad selection of secondary skills as well. Characters come with fairly detailed backgrounds – their quirks, social class, family history, contacts and so on. These factors encourage roleplaying. 3) The system rewards clever play. Combat is fast and fun, but deadly, and some time spent working out how to catch one’s enemies off guard is time well spent. Effective use of Joss is part of that clever play. 4) The game is brimming with atmosphere, not just in its mechanics (the many forms of magic, the various skills available), but in its default setting, Aerth. Goblins are not the simple low-level combatants of D&D, but a form of faerie, with supernatural powers. Would I run Mythus? Yes, although I have no immediate plans to (I’m about 1/3 of the way through Pathfinder’s Rise of the Runelords adventure path, and plan to run GURPS Traveller after that). However, that’s after experiencing the game under someone who’s played it extensively, and seeing how it hangs together as a whole. For more than 20 years I’ve had the game sitting on my shelves, trying to make sense of it, only to be turned off by the poor organisation. Would I recommend others do so? That very much depends on what you’re after in a game. Mythus is not a game to play for a session or two and set aside. It’s a roleplayer’s game, not a tactical battlemap game, and it rewards creative, story-driven campaign play. If that sounds intriguing, then it may well be worthwhile to spend the time getting to grips with its complexities. Put it this way: I can see why more than 20 years after it went out of print, Mythus’ fandom is (a) small and (b) dedicated. This is not a game for everyone, but it offers a great deal to those for whom it strikes a chord. This entry was posted in Gaming and tagged Dangerous Journeys, Gygax, Mythus. Bookmark the permalink.